A few weeks ago I went over my putting setup and stroke in detail. It’s one thing to putt on your carpet at home. It’s quite another to putt on live greens. This post is about how I get the ball in the hole. For makable putts, of eight feetish or under, I am definitely challenging the hole. Putts around 15 feet and longer I am just trying to get the ball near the hole so luck can take over. For the in-between distances, it depend on how I’m feeing that day. With a twelve-foot putt I might be go for it one day, or just try to get it close on another. In any case, I use a spot putting system. When I line up my putt I will pick out a spot on the green about two inches in front of the ball. Dave Stockton likes one inch, but that’s too close for me. When I putt, all I’m concerned about is making that two-inch putt. Then, with the right pace and a good read the ball will go in the hole. I find if I don’t spot putt, but think all the way to the hole, I end up trying to steer the ball in, and that seldom works. As for pace, you learn that only by practicing. I practice pace a lot, with 20- to 40-foot putts, because that is the way to avoid three-putt greens. I like to the ball to end up within five percent of the total distance. The same goes for green-reading. You can only learn that from practice. So practice! Good putting is as much in your mind as in all the technical matters. The one thought I have heard good putters talk about and which really works is this: as you are about to make your stroke, you cannot care whether the ball goes in the hole or not. Get prepared for the putt, and think only about making that two-inch putt. As for the actual putt, you will either make it or miss it, and some of the difference is up to the putting surface, which you have no control over. You can hit the perfect putt and it might not go in. So do all that, and apply the mechanics you learned in your back room, and practice!, and you’ll be a much better putter. And what do I mean by practice? Spend as many minutes on the putting green as you do on the mat hitting balls. Have you ever stood over the ball just knowing that this shot is going to be one of your best? And when you make your swing that’s exactly what happens? Now remember the times when you stood over the ball and you started worrying about where the ball was going to go because you KNEW there was something wrong. Or whether you would be able to make good contact and you didn’t. Ken Venturi said many times that good players do not get out of swing. They get out of position. You put them back in position and their swing comes back. That’s what your stance does for you. It gets you in position to make your best swing. I would imagine you never practice your stance. If that’s true, then please start getting into the habit. You can do this inside your house. Drop a ball on the carpet and address it with your 5-iron. How do you feel? Do you have that feeling of great confidence, or is it just you standing up to the ball? Break your stance, take a few steps away, then approach the ball and set up again. How about now? What you’re watching out for are minute changes in your grip, in your posture, in ball position, and anything else that makes one stance feel different from another. What you’re practicing is perhaps the most important thing you can practice. Your swing emerges from your stance. Your stance leads into your swing. Good golf is played by making your best swing more often, and that means taking your best stance more often. When you’re in position, you don’t need swing thoughts, and you don’t need to think about whether this will be a good shot or not. Your mind gets filled with the quiet confidence that all you have to do is get the club in motion and everything will be all right. Believe me, when I’m at the range and I’m in position, I KNOW that my best shot is coming up next. My bad shots? They didn’t happen because my swing changed. They came because I took my stance for granted and couldn’t swing the way I wanted to. Of course you want to practice your swing, but spend time practicing your stance, too. It will really pay off. A few weeks ago I mentions that I was practicing a lot for short putts and am getting REAL good at them. I’ve been putting in my back room since the middle of August, several times a day, and have refined my technique fairly well. The description that follows might get you thinking in detail about how you make your putting stroke. First of all, I use my forefinger interlocking grip. This grip prevents one hand other other from dominating the stroke. Both hands work as one unit. My grip pressure is very light — just enough to keep the putter from flopping around in my hands. The ball is about two inches inside my left heel. I don’t pay much attention to where my feet go, but they almost always end up perpendicular to the target line, with the right foot more forward than the left by a inch or two. Because I haven’t found the placement of the feet to be important, I place them before I aim the putter. I don’t want to aim the putter and then have the aim altered when my feet move. I aim by placing the putter in front of the ball and aligning the face using a mark I drew on the topline of the putter that marks the sweet spot. I make sure the putter shaft and my forearms make a straight line when viewed from down the line. This causes me to arch my wrists upwards a bit. The effect is to make it easier to take the putter straight back and through. When your wrists are lower, you take the putter back and through in an arc, which is a less accurate stroke in my opinion. Once I’m aimed, I put the putter behind the ball and make my stroke right away. The takeaway is slow. That way I keep the putter swinging on line. I know that face angle is more important than swing path, but swing path still counts for something. By keeping the putter on the right path, I ensure all the more that the putter face stays square. I also imagine that it is the sole of the putter that is being taken away from the ball. This make the takeaway smoother, preventing me from jerking the putter back. The stroke is fairly short, straight back and straight through. If you hit the sweet spot, you don’t need a long backswing to get the ball to the hole. I do what Gary Player wants us all to do — keep your head down and not lift it to look as soon as the ball has been struck. Believe, me, this helps. I am in continuous movement. 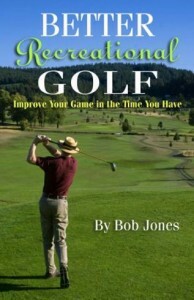 The entire procedure, from setting my putter in front of the ball to aim to to hitting the ball, takes less than ten seconds. There is a basic approach to the swing that many golfers take because it seems so obvious to do. And yet it is the wrong approach and is what prevents them from doing with the ball what they set out to achieve. He takes a phrase from F. Matthias Alexander, who calls it end-gaining. This is thinking about what the desired result to the exclusion of the best way to attain that result. How does this relate to the golf swing? It comes out as making movements which we feel will put the ball in the fairway off the tee, or on the green from the fairway. And they never work. 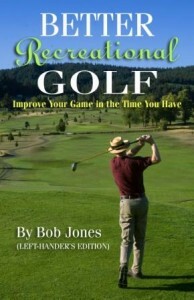 In golf, Boomer points out, the obvious way (to us) is seldom the right way. Very little of the golf swing is natural. 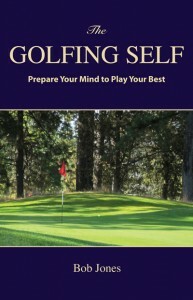 The golf swing is a learned art, which must be trusted to deliver the desired result. This is why you see so many weird-looking swings out there. People are trying to hit the ball with the club in a way they think will work and it does just often enough that they mistake luck with skill. Golf is not about hitting the ball. It’s about making the right swing with a ball in the way. You don’t play well by thinking about what you have to do to hit the ball in a certain direction or a certain distance. You play well by thinking about how to make the right swing. You must concentrate on the means, not on the end. So when you are on the practice tee and not hitting the ball too well, do you say to yourself, “Maybe if I try this,” and two indifferent shots later you think, “How about trying this?”, getting yourself deeper and deeper into trouble because you’re trying to guide the club into the ball. That’s end-gaining. Instead of being in control of where the ball goes, we must be in control of what our swing does. Then, when we sweep the club through the ball in the proper way, it will go where it is supposed to go. What then is the proper way to swing the club? It’s most likely what your pro taught you in your last lesson (you do take lessons, don’t you?). Learning my Six Fundamentals won’t hurt you, either. Let me try to seal the argument this way. Do you remember the shots you made, and I know you’ve made them, that went long and high and straight and it was because your mind went blank for a moment and you just swung the club? You weren’t thinking about how to make the ball go to a certain place, it just went there? That’s what I’m talking about. If you can take that momentary lapse in concentrating on the wrong thing, and make that your habit, and combine that with good technique, good golf will be yours. Every year, when golf season is over, I work on my swing, starting over from the start. I go through my bag, from 9-iron to driver. If you have seen some of my recent videos on YouTube, you know I have a little practice station in my back yard. I went out to my practice mat with my 9-iron, and hit just that club. Over and over. When I get 3 out of 5 shots just right consistently, and the other two aren’t bad, I’ll move up to the 8-iron. And then one club at a time when I’m ready for it. I probably won’t be up to the driver before the rainy season hits. We’re having warm weather with clear skies, but in Oregon that won’t last too long this time of year. I’m dedicating myself to building the Six Fundamentals into every swing. I review them all before I hit a ball. One thing I’ve added is to sweep the club through the ball, and not to hit at it. That is making a world of difference. Aside: If you get the latest Golf Digest, with Beef Johnston on the cover, you’ll find an article inside by Bob Toski about swinging with your hands, and not with the big muscles that is so much in vogue nowdays. This is exactly what I said in SF. I advise you to get this article and read it carefully. A lot of what pros say about the risks of your hands being in charge of your golf is baloney. But back to my program. If you want to be better ball striker, take the swing you have and work your way through your bag, one club at a time, demanding a quality hit with every ball before you move up. Really. This works. The other part of getting my game back in order is hitting two to four-foot putts in my back room. I am getting REAL good at these. Sinking these putts is how you avoid three-putt greens or not getting up and down.